the life of a wife: Read: Is Everyone Hanging Out Without Me? Read: Is Everyone Hanging Out Without Me? I finished reading Is Everyone Hanging Out Without Me? last night. I have to admit that I had super-high expectations after everything I had heard about it. The first few chapters I was unimpressed--I kept waiting to burst out laughing and pee my pants because it was just that funny. Then I forgot about all the hype and my expectations, and I just read it. And I enjoyed it, and it WAS funny! 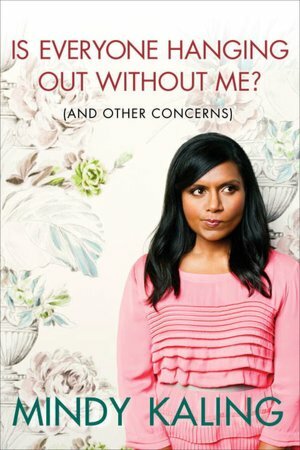 Mindy Kaling has some pretty spot-on opinions and observations about life, and it was a fun read. I've heard that Bossypants is better and funnier, but I haven't read that so I can't make a comparison. But I would recommend reading this one if you're looking for a fun or light read - perfect for a spring day relaxing in the park or laying on the beach this summer! I've been wanting to read Bossypants too, but just haven't had a chance. My reading wishlist is way too long! I recently read Anthony Bourdain's Kitchen Confidential and LOVED it. I may or may not have told you about it already, but I enjoyed Bourdain's candor and tales in the kitchen. Interesting stuff. I've been wanting to read this one, and I liked bossypants, so I know I'll enjoy this too. I'm still in the middle of the hunger games trilogy, exciting stuff! I need a good book to read right now. I may have to pick this up! Thanks for sharing! I haven't read this or Bossypants, but I do want to read both. I just finished reading Sophie Kinsella's new book and now I'm starting "One Thousand Gifts" but it's a little heavy, so I'm struggling to get through the first chapter. Have you read that yet? Happy hump day! Bossypants is also a super quick read, do it! good to hear you enjoyed her book, well after the first few chapters and just read it to read it. definitely looking for a light hearted read, thanks for the review! I think she's hilarious so I'm glad to hear the book was fun. I've been meaning to read Bossypants too but am seriously behind on my reading! I've never read any of her books so thanks for the suggestion! Then I will definately have to change my expectations before diving into this book. I never cared for her character her comedic chops on The Office but had heard so much about the book as well. I read Bossypants and it was hilarious and a great read!